The Maine State Fire Marshal’s office says drones are helping them in their fire investigations. More and more, the Maine State Fire Marshal’s office is realizing the difference a drone can make. Earlier this summer, footage from a drone flying over a massive mill fire in Sanford helped investigators determine it was an arson, and make an arrest. The overhead perspective allowed them to study burn patterns in a building that was too dangerous to enter. “It was able to give us a visual of the inside of that mill that we would not be able to get,” said Fire Marshal Joe Thomas. That footage was from a drone owned by the York County Emergency Management. For now, Thomas is hesitant to get his own drone for the State Fire Marshal’s office, despite its applications. “We want to get our arms around the technology, and deal with the legal questions we still have,” he said. Maine State law requires law enforcement to obtain a warrant before flying a drone in a criminal investigation. 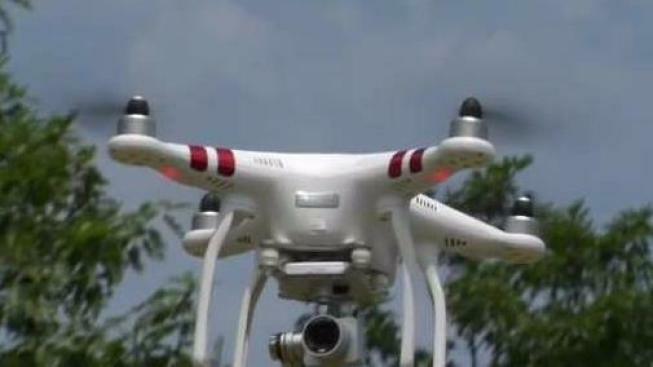 Fire officials do not need a warrant if they are using a drone to survey the scene of a fire. Thomas can foresee a situation, like the Sanford mill fire, where his department’s drone would start out surveying the scene, but quickly become a tool in a criminal investigation once they realize they could be dealing with an arson. “It could change within the blink of an eye,” he said. Once that happens, does law enforcement need to land the drone immediately? According to the ACLU of Maine, the law isn’t clear. “The technology is advancing very rapidly, and the law is slow to keep up,” said Oami Amarasingham, advocacy director at the ACLU of Maine. She said another gray area lies in the practice of having a civilian pilot shoot drone video on an investigator’s behalf. Amarasingham said civilian pilots do not need warrants to fly over the same areas police do — and they could serve as a potential work-around for law enforcement avoiding a warrant. “This practice raises a lot of red flags,” Amarasingham said. Both the ACLU and the Fire Marshal said the law attempts to strike a balance between public safety and privacy.